Another disappointing quarter, but another quarter of backlog progression -- the crazy world of being a Fluor Corporation shareholder in 2018. Shares in engineering and construction company Fluor Corporation (NYSE:FLR) fell a whopping 24.5% in October, according to data provided by S&P Global Market Intelligence. The decline marks a volatile period in a yo-yo year for the stock. Somehow, Fluor stock is up 1% on a year-over-year basis, but it's been anything but a calm year for the company. 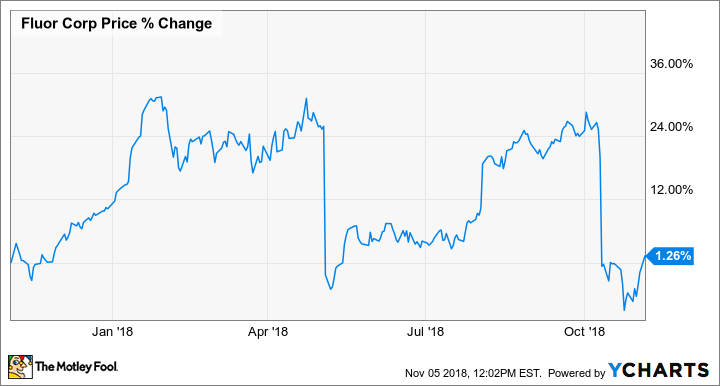 Going back to the first-quarter results in May, the company missed earnings estimates and slashed its full-year earnings-per-share (EPS) guidance to $2.10-$2.50 from a previous range of $3.10-$3.50, largely due to "challenges on a gas-fired power project." Fast-forward to the summer, and Fluor's second-quarter results saw the company steady the ship and affirm full-year guidance while generating a sequential improvement in its backlog -- the stock rose 12% in August. Fluor Corp provides project management services for heavy industries. Image source: Fluor Corporation. The damage in October was done by the preannouncement (on Oct. 10) that Fluor would miss third-quarter revenue and earnings estimates due to "expected pre-tax charges of $46 million relating to close out efforts on a downstream project in Europe and $35 million for forecast revisions on a gas-fired power project," according to the company's press release. The results have subsequently been released and caused yet another cut in full-year 2018 diluted EPS guidance to $1.80-$1.90. The execution challenges have soured what was supposed to be a year of recovery for Fluor Corporation. For the first time in a few years, some of the end markets the company has heavy exposure to -- mining, energy, and heavy industries -- are seeing a return to capital spending, but as you can see above, Fluor isn't taking full advantage. It's a pity, because the company reported $9.6 billion worth of new awards in the quarter, including $5.4 billion in mining, industrial, infrastructure, and power, $3.3 billion in government, and $644 million in energy and chemicals -- for reference, analysts expect Fluor's sales to be around $19 billion in 2018. Meanwhile, the backlog increased to $34.9 billion from $29.3 billion in the previous quarter and $32.9 billion a year ago. Fluor's end markets are definitely picking up. Fluor's execution difficulties have eroded confidence in the company's ability to pull profit from a pickup in its key end markets, and investors need to see a few quarters of solid execution before feeling completely comfortable with the stock. Management is holding an investor day on Nov. 16; it's promised to give color on the outlook for 2019 and will hopefully indicate a blemish-free fourth quarter as well.